So I've got a question. At what point does wishful thinking really just mean blatant disregard for reality? Because yeah, it's March now and yeah, that probably means nice weather and springtime for most places, but I'm in Nebraska. While it might be 60 degrees and gorgeous today, tomorrow it's supposed to be a high of 38. I want so badly to jump into Spring fashion and try to will more sunshine filled days with my fun new outfits, but the crazy weather fluctuations have battered my spirit and I'm feeling a little vulnerable over here. To bare my ankles or to hide away under all my layers, that is the question. Since this transitional period has left me a little timid, I've been living vicariously through the internet (don't we all?). Partially because I'm daydreaming of the sun on my skin, but also so I can start planning my Spring wardrobe. Like I've mentioned before, I try to build a capsule wardrobe each season, á la Anuschka Rees. Part of that planning process is discovering your tastes for the season, figuring out what kind of outfits you'll want to create, and seeing patterns in those styles so you can create a sensible shopping list if necessary. I've just about wrapped up my planning session for this season, so it's time to share what I've been into! After wearing all black everything more days than not for the last few months, I've been gravitating toward a lot of lighter colors. Creams, whites, light grays and khakis are all over my inspiration board this Spring. Even when darker colors pop up, they're not full-on, saturated black, but instead they're dark browns or navy blues. I still tend to avoid really bright or saturated colors -- some things just don't change that much. 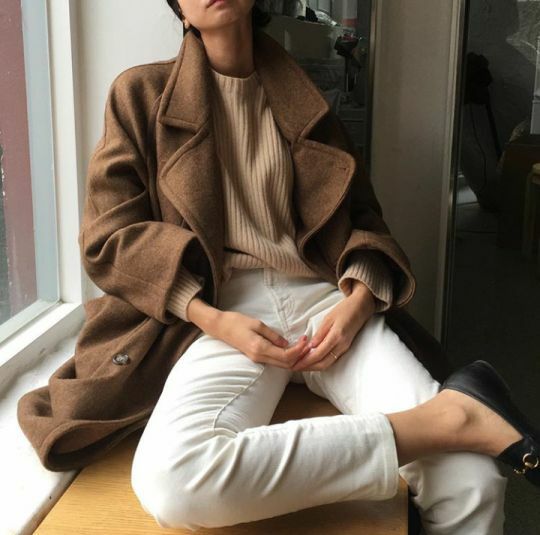 Set me up with some earthy neutrals over jewel tones any day, thanks. In the past, patterns didn't really play a huge role in my style, but I still am loving the checked pattern that I've been wearing to death in my winter capsule. As Spring warms up, the blazer might be a bit too heavy but I can definitely see the same pattern making its way into some shorts or pants. I've also really become obsessed with all things tortoiseshell. I want it everywhere! On sunglasses, hair accessories, earrings, shoes, buttons -- especially buttons. I don't know why but big tortoiseshell buttons on a cream cardigan is a look that has just been permanently seared into my brain lately. If left unchecked I might soon be found wandering the streets clutching tortoiseshell accessories and muttering 'my preeeeciousss' over and over. Stay tuned for that. I would also be remiss if I didn't mention my love for ribbed knits that has seemingly come out of nowhere. My current theory is that a ribbed finer knit is Spring's answer to Winter's chunky knit, which I was also very into. Ribbed, long sleeve, neutral-colored lighter knits I can already tell are going to be my rock this season. They're practical, easy to wear, and go with everything, but they also provide a little visual interest with their unique texture. That's a quality I'm always on the lookout for when the majority of my wardrobe is made up of basics. For more visual interest I am also looking to really shiny satin to give an everyday Spring look a little extra juice. I'm just dying for luxurious, silky, fluid feel after hiding under a bunch of wool layers, even if they are cashmere, for the last few months. Give me a nice shiny button up in a light sand or brown and I'll be in heaven. 1. High waisted, mid blue, cropped straight leg jeans. So far I'm leaning toward these at Topshop. 2. Cream bottoms. Probably denim because I'm lazy, but maybe a lighter fabric if the right pair comes along. 3. 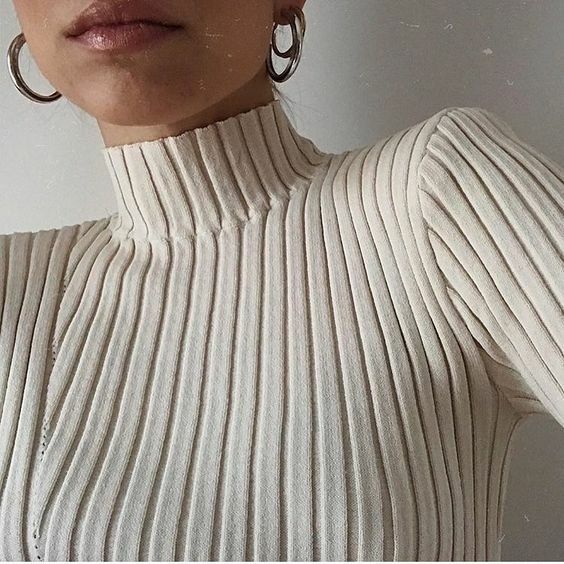 A ribbed, long sleeve, light weight neutral colored knit. Preferably in the cream to brown range. 4. A shiny satin button up, also neutral. I'll go hit the shops (aka not leave the comfort of my couch and instead shop entirely online most likely) and share what I find!